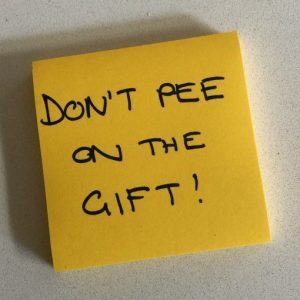 One of my favourite pieces of advice from Jancee Dunn’s How Not to Hate Your Husband After Kids is “don’t pee on the gift”. It means don’t tell your spouse you’re OK with something he or she wants to do (a weekend getaway, an hours-long bike ride, an afternoon nap) and then fume about it after the fact. Our dog has just had surgery and has been pretty sick with an infection. However, the (very shiny) silver lining is that I get a weekend at home to look after her, while J takes the kids on our planned family trip to visit his parents. This is possibly one of the greatest gifts J has ever given me and just the anticipation of a forthcoming weekend alone brings me so much joy. I am very conscious that J’s weekend (involving 7 hours of driving with a 5 and almost 2-year-old) might not be quite so joyful, but I’ve told him (repeatedly) that he can’t pee on the gift! Other things that have brought value/joy to my life lately…. I was in a bit of a blergh mood during a morning commute to work this week. Chat 10 always makes me smile and the latest episode was no exception. It was J’s birthday last week and I made these chicken fajitas for his birthday dinner. The salsa is especially delicious (note: I used some chipotle sauce as a substitute for the dried smoked chipotle) and it made me appreciate the value of a great sauce/dressing/condiment to transform an ordinary meal into something super tasty. On a related note, I’ve just started having Dijon mustard on my toasted sandwiches and have added this to the long list of things I wonder why I didn’t discover sooner! I’ve recently started experimenting with the Shortcuts app on my iPhone after listening to this episode of the Day One podcast (Day One is my journaling app of choice) and subsequently a few episodes of Automators. Much of the technical detail goes over my head but it’s still been fun to engage my brain in a new and geeky way and come up with interesting ways to quickly/efficiently handle some of the things I do with my phone – like journal entries, starting new timers in Toggl (for time tracking), and one I set up recently where Siri will tell me what time I’m expected to arrive home. I wrote about this in my what worked in 2018 post, and last week my dear friend Emily and I sent our 52nd weekly reflective update. This practice continues to be so important to me and I’m so pleased/proud that we’ve been able to keep it up for a year (I doubt I would have been able to without the accountability to Em). Last time I posted about the WIR, lots of people asked for the questions and I do intend to do a separate post at some stage. 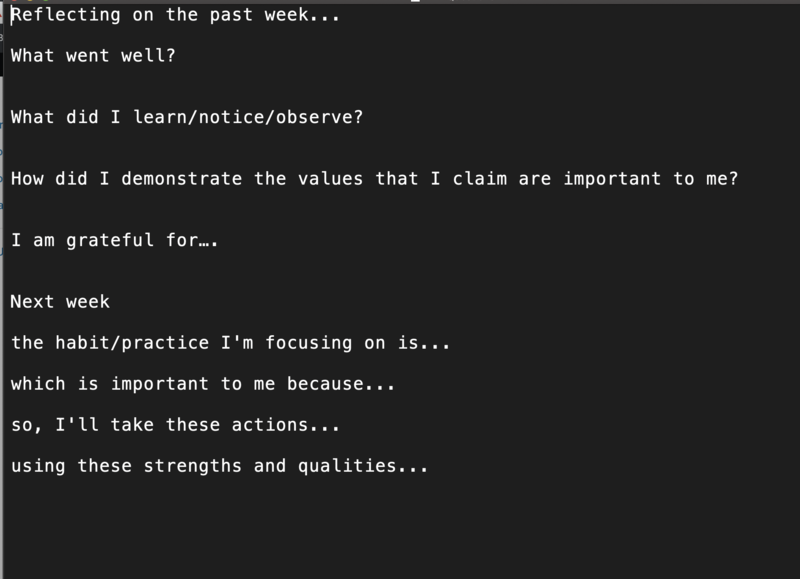 But in the meantime, these are the questions we’re currently using (they’ve iterated a little over time). Credit and much thanks is owed to Amanda for introducing me to her similar practice and sharing her questions. As most Australian parents of preschoolers would know, new episodes of Bluey are out. J and I think Bandit and Chilli (Bluey’s dad and mum) are pretty great parenting role models! If you’d like to receive Head & Heart posts via email, you can sign up here. These Head & Heart posts, like many things, get harder to write the longer I put off writing them. I’ve found that there is a small window between feeling like I have enough to say and having too much – when I struggle to know where to start and to end, what to leave out and what to include. But inspired by the ‘good list’ episodes on Tsh Oxenrider’s The Simple Show, I’ve decided to simply share 3–5 things that are adding value to my life right now. For the past six weeks or so I’ve been getting up around 5.15am and going for a 1/2 hour walk or jog with the dog, followed (on most mornings) by a quick 3-minute meditation. Exercising and meditating have such a significant impact on my mental wellbeing and I’m definitely feeling happier, calmer and more positive. And I’ve been surprised how easily I’ve adjusted to the pre-dawn start – I suspect it would be even easier if I could consistently achieve an earlier bedtime (that’s another challenge!). I’ve been plodding my way through the C25K program again. 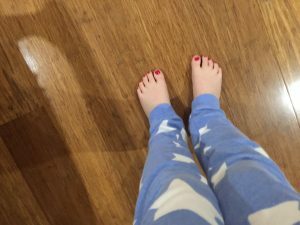 I want to run a 10k this year and a 5k still feels a long way off – let alone 10! But I’m trusting the process and the program. As a facilitator and trainer (that occasionally has a tendency to want to have a lot of say over outcome!) this feels important to practice. I’ve also been using this Intervals app which is great! Jar salads for lunch have been a complete game changer! 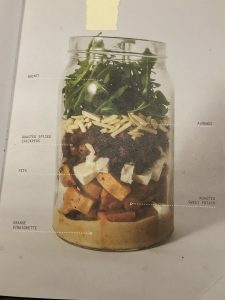 Jar salads have been a game-changer. 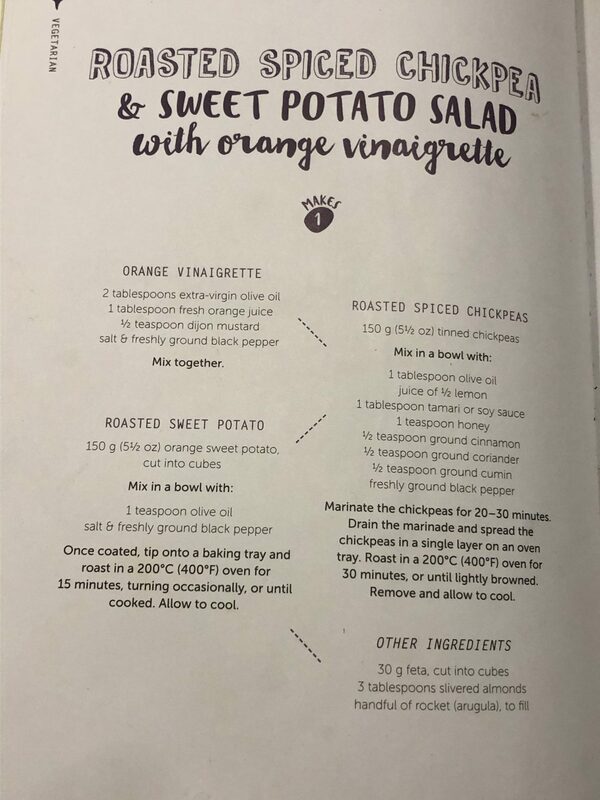 This roasted spiced chickpea & sweet potato salad with orange vinaigrette from Jar Salads: 52 happy, healthy lunches by Alexander Hart is our favourite. We got some glass jars from Target and I’ll make up 5 or 6 at a time. I got an Apple Watch for Christmas and one of my favourite and most used features is being able to ask Siri to add an item to our (shared) grocery list (in Reminders) at any time, wherever I am. I’ve also changed my Siri to the Australian male voice after reading this post (see tip #34). As we, like many families, try to navigate the demands of kid drop-offs and getting to work, I’ve often found myself feeling rushed and rushing the kids (which never ends well!). So I’ve been thinking about this story from Derek Sivers a lot lately. After a bit of a run of audiobooks earlier in the year, I’m back in a podcast phase. I binged the entire series of The Drop Out, and two other recent discoveries that are on heavy rotation are David Tennant does a podcast with…, and Feel Better, Live More. One of my favourite posts to write last year was a wrap up of what worked for me in 2017. This 2018 edition has been sitting in a half-completed draft form for weeks, and although the time for new year reflection has probably passed (now that we’re more than a full month into 2019!) I wanted to publish it anyway! Some of those things from 2017 (like journalling and decluttering) continued to be an important part of my life in 2018 and others dropped away (like the TV-ban for Ella!). Here’s what stood out as things that worked for me in 2018…. We live a few hundred metres from the local primary school. When we bought our place I don’t think either of us imagined that we would be living there 10 years later, so proximity to schools wasn’t something on our radar. 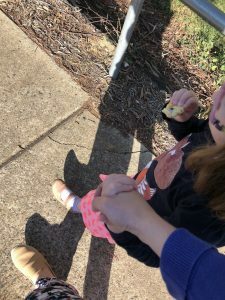 E started pre-school in 2018 and walking her to and from school was an unexpectedly delightful part of my week. It’s a short amount of uninterrupted time to connect and hold hands and have random conversations. I was quite sick in 2017 with persistent pneumonia and had more courses of antibiotics than I could count. While filling another prescription in late 2017, the pharmacy assistant recommended I take a probiotic. Perhaps it’s just a placebo effect, but I had no further chest infections in 2018 and largely avoided any significant colds. In March 2018 my friend Emily and I started exchanging a weekly email based on a series of reflective question prompts (which were suggested to me by my friend Amanda (who has a similar regular email exchange practice)). The questions focus on what worked well, gratitude, and values and intentions. The simple act of asking (and answering) these questions makes me more alert to the good things in my life. I’ve gone through periods of meditating consistently in the past and always found it beneficial but I tended to let it go during periods when I was busy or stressed at work and actually needed it most. Since March 2018 I’ve had a pretty consistent practice – not every day – but something I do more often than not. And my meditation bar is pretty low – it’s typically just a 5 min guided meditation using the Calm app. After the blur of maternity leave and sickness in 2017, I returned to work in 2018 doing more of the training, facilitation and coaching work I love. I am so grateful to have work that I enjoy and that energises me and has the flexibility that I need at this stage in my life. I look forward to going to work and I think it makes me a happier, (mentally) healthier mum and partner. One of the things that helped the return to work was splitting care days with my husband, J. It’s much easier to leave the house to get to work when you don’t also have to stress about getting little people clothed, fed, cleaned up and to daycare/school at a certain time. 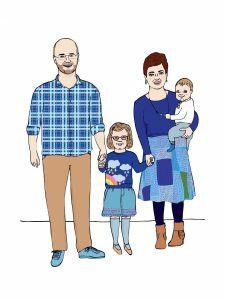 It also helped me to reduce any tendency toward maternal gatekeeping and created the space for J and E to bond and develop their own little weekly rituals. I discovered I actually enjoyed running about 9 or so years ago and did it pretty consistently until E was born. Since then I’ve struggled to get back into it. But in 2018 I actually finished the C25K program and did a 5k fun run. Using a C25K app was great as I just did what the friendly voice told me to do – there was no thinking or planning required on my part, and slowly building up run/walk intervals helped to avoid any injury. I didn’t maintain the running in the second half of the year, so am starting again – with the goal of doing a 10k in 2019. I read The Barefoot Investor back in 2017 but have been pretty slow to fully jump on board. In 2018 I took a couple of positive steps toward getting our financial s#*t sorted – cancelling our main credit card and negotiating a lower interest rate on our home loan. Related – Season 1 of The Pineapple Project podcast was also really good and prompted me to make a few other changes like buying more second hand clothes. When I look back at old journal entries and angsty ‘what am I doing with my life?’ notebook scribbles, it’s clear now that coaching others (in an informal sense) has been something that’s provided much joy and energy in my work life, so I wonder why it took me so long to actually do some coach training? The IECL Level 1 course in February exceeded all my expectations. I learned so much – not only about coaching, but about myself, and about facilitating engaging training. This course has had a massive impact on my coaching practice and has provided the foundational skills and confidence to start coaching in a more formal capacity. What I wasn’t expecting was the significant impact the course would have on how I approach other close relationships in my life – I think I’m a better listener and better at maintaining ‘detached empathy’. On a related note, asking what rather than why has also been a beneficial habit to practice. I’m continuing to try to declutter and be more intentional about ‘stuff’ but there were definitely a few ‘things’ that added value to my life in 2018. AirPods – I’m not sure I would have bought a pair (they do look ridiculous) but J was gifted some which I subsequently appropriated. I’ve really enjoyed being able to listen to podcasts/books and to go running without being physically tethered to my phone. A multi-cooker – Like many families, dinner time is stressful with kids/work/childcare pickups so having a cooked meal ready to go when you walk in the door is a lifesaver. The timer and the pressure cooker function on this one make it a big improvement over the old one I had. Several recipes from The Easiest Slow Cooker Book Ever are now staples in our house. A fly swat – A bit of a random addition but I honestly have got a lot of use out of this since J bought one for me at the start of 2018. I hate flies, but I also hate spraying fly spray in our open plan kitchen/dining area. A custom portrait from Able & Game is one of my favourite things! A custom portrait from Able & Game – I have been coveting one of these for years. It makes me smile whenever I look at it. A hot water bottle – This wasn’t a new acquisition in 2018, but just something I started using almost every night from April-October. Getting into a toasty warm bed is the best! An insulated drink bottle – My old Camelbak leaked and annoyed me, so when I decided to upgrade in late 2018 I got an insulated bottle and it’s great. I got a Cheeki bottle and I’ve converted the whole family now too (they have ones from EcoCocoon). 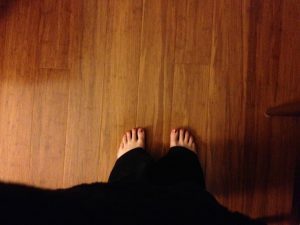 Often I catch myself in ‘when/then’ self-talk, particularly in relation to parenting – ‘when my kids sleep through the night then I’ll be able to get up early and go running’, ‘when we don’t have to pay for daycare anymore we’ll be able to consider upgrading the house/take a holiday’, ‘when the kids are older I’ll have more flexibility to travel with my work’, ‘when I don’t have to spend my evenings cleaning up vomit I’ll be able to write more blog posts’ (that was last night)…. It’s like life with little children, although very much planned and wanted, is some kind of temporary detour from the life I could or should be living. Lately, I’ve been trying to remind myself that this isn’t a detour, this is my life, and to lean into the experience rather than looking for what might be on the other side. So when I read this piece from Omid Safi this week his wise words resonated strongly – “Your life will not start down the road. This is life. Be here now. 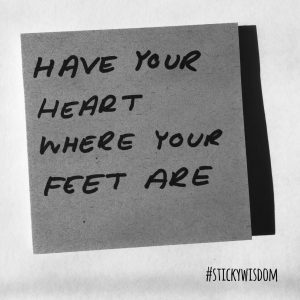 Have your heart where your feet are.” I love this so much and have added it to my collection of #stickywisdom (I’m trying to figure out the best way to collate and share my #stickywisdom, so I’m experimenting with a new dedicated Instagram account – sticky.wisdom). E has decided she wants to be a geologist when she grows up (I think she’s keen on the idea of finding a heap of gold!). Despite doing at least a semester of university-level geology, I can’t remember even the basic info about the different rock types so we found some YouTube videos. Thank goodness for YouTube! But it was a moment when I kind of missed having a World Book encyclopedia on the shelf. Apparently, the best way to learn anything is to teach it to a child, so instead of completely outsourcing responsibility for satisfying my children’s curiosity to YouTube, I’m going to view fielding questions as a highly effective way to enhance my own understanding of a subject. And it’s also got me thinking about how I can integrate the Feynman technique into the workshops I facilitate. Mars is visible at the moment (as is Saturn). I only learned this from overhearing an episode of the Imagine This podcast that E was listening to. I’m rarely outside in the evening (especially in winter), but we’ve downloaded the super cool Night Sky app on our phones and have enjoyed rugging up and doing some planet spotting. If you’re in Canberra and have little kids you may be keen to check out this star gazing playgroup session that our babysitter Sami is running at the end of the month. Last weekend we had an unexpected visitor – ‘Patch’ the bear from E’s pre-school. Basically the kids take turns taking Patch home for the weekend, and you’re meant to involve Patch in your weekend activities, and add some photos/text to a journal for your child to share with the class on Monday morning. 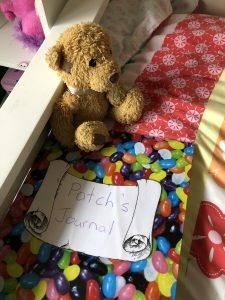 Of course this means that someone has to remember to pack Patch for any weekend outing, and then photograph Patch, and print the photos and arrange them with text descriptions in the journal. Whenever we have one of these visitors I’m reminded of Annabel Crabb’s ‘The Wife Drought’ where she shares a similar story about ‘Chiquita the kangaroo’ to illustrate the type of work involved in managing a home/family – work that’s not paid (and often barely recognised) but that you feel emotionally obligated to fulfil (and super guilty if you stuff up). And it’s work that’s most often undertaken by ‘wives’. Given my life stage it’s hardly surprising that my virtual feeds and in-person conversations are full of discussions and commentary that include many stories like those about ‘Patch/Chiquita’ including this piece – I decided to drop my family’s mental load for a week. The ‘list’ also came up in this episode of Dear Sugars on emotional labour which was quite good. But, I feel like in this episode, and in many articles, there is a conflation and confusion of the terms emotional labour, invisible work, domestic labour, mental load etc. I wasn’t really aware of this until I read Please Stop Calling Everything That Frustrates You Emotional Labor. This episode of WorkLife on faking your emotions at work also helps to explain what emotional labor looks like in a work setting. Regardless, I do want an ‘I am the List’ t-shirt. I’ve been listening to a lot of the 5 Things podcast. The premise is quite simple but a unique take on the traditional interview – guests bring in 5 physical things that they treasure or that are resonant in some way, and share the story of their life through these objects. The guests don’t appear to be particularly famous (Manoush Zomorodi was the only name in the guest list I recognised), but it’s so fascinating to hear about different stories/lives and I love how physical objects can be used to elicit such deep, meaningful, personal conversation and connection. Of course, it’s got me thinking about what my five things would be too. A new recipe that’s getting a lot of use in our house – ‘boost your basic’ double choc chip cookies from One Handed Cooks. Yes, they are choc-chip cookies so they’re not really a healthy snack, but I prefer these to the usual ones that are heavy on the butter and sugar. I’ve probably already shared it before but their carrot cookies (with no refined sugar, eggs, nuts or dairy) are a lunch-box staple at our place. Head & Heart is an occasional update about the things that have engaged my head or heart recently – things I’ve been pondering, articles I’ve read, podcasts I’ve listened to etc. If you’d like to receive the updates via email, you can sign up here. With each birthday it’s interesting to notice how parenting challenges shift from the basic needs around sleeping, eating etc, to deeper ones around raising a decent human being. This post on fitting in vs belonging was one worth reading and will be something I try to remember as Ella gets older and continues to navigate friendships and social structures. I love love love this idea! If you’re expecting a baby, or know someone who is, why not skip the baby shower and throw a post-partum party instead? Recent favourite podcast discoveries that I’d recommend include Self-Helpless (3 comedians discuss various self-help topics/books) and Briget Shulte’s Better Life Lab (on the art and science of living a full life). I’m also excited to see that Jamila Rizvi’s new podcast, Future Women, is launching next week. I also really enjoyed this episode of Hidden Brain – The Edge Effect – which includes some fantastic stories about diversity and creativity. Some people in my network who are doing great things and that I think you should know about…. My friend Zoya Patel‘s debut book, No Country Woman, is coming out next month! I’m so excited to read this and share it. Zoya is one of the smartest, most insightful people I know and her writing about race, feminism and identity always makes me stop and think. She’s doing a number of events over the coming months – including a launch in Canberra on 19 August, and the Melbourne Writers Festival! Julie Boulton has an excellent weekly newsletter, The Greening Of, about her journey towards more sustainable living. I always learn heaps and I love her honest, engaging, humourous writing style. Lead Mama Lead founder, Summer Edwards, is running the next intake of the Overcoming Overwhelm course in September. This is an online course for mamas who are struggling with and/or feel like they’d like to get better at dealing with feelings of overwhelm, guilt and exhaustion in their life. It’s a supportive, gentle program (designed to fit in around the lives of busy women). I’m about 2/3 through the pilot program and it’s definitely led to some increased self-awareness around the priorities and values in my life and the habits and practices that help and hinder my wellbeing. (You can also get 25% off if you sign up before 1 August). On the topic of photos, Ella uses an old iPhone to listen to podcasts and audiobooks. She’s recently discovered the camera function and has taken (quite enthusiastically) to documenting her life and creating movies! It’s been fun to look through the pictures and videos and get a glimpse of what the world looks like from her perspective. There are lots of selfies and posed pictures of toys and hundreds of walls and windows and floors and ceilings (some quite artistic, some not so much). I particularly love this one – mainly because exactly 5 years and 12 days earlier I’d taken a very similar shot (in almost the identical spot) as I paced my lounge room in early labour about 10 hours before we met Ella. The other big news to share since my last H&H update is that I’ve returned to (paid) work following my maternity break. I’m pleased to be facilitating some of the core skills and graduate development training programs at the Australian Public Service Commission, and I’m also doing some freelance facilitation, coaching and training. Helping individuals and groups to learn and change and to see themselves and the world a little differently has been a pretty consistent thread through my work for the past 8 or so years, but facilitation has been a somewhat peripheral part of the various jobs I’ve had. I feel so excited to be diving deeper into this work and to commit to building my own skills, knowledge, experience and practice – it feels like the work I’m meant to be doing. I have some availability for work for the remainder of the year, so if you need some support with running meetings, workshops or training, please get in touch. All the details are over on the Sticky Note Consulting site. Finally, I’m going to trial sending out Head & Heart updates as a newsletter which may make them easier to follow (for the handful of dear friends that actually read them)! If you’d like to sign up, you can do so here. I’ll keep posting them to the blog too! Sticky Wisdom from my nerd-crush Adam Grant on his great new podcast, WorkLife. In my experience, the people who are most impressive and easy to work with are those that not only show a willingness to learn, but a genuine love of learning and a desire to grow and improve.